Welcome back to the Comic Book Herald reading club. This week we read a couple early 2000’s Marvel cosmic entries, Marvel Boy by Grant Morrison and J.G. Jones, and Captain Marvel by Peter David and Paco Medina. As always, you can see what the rest of the CBH club is saying in our club forums, and you can always provide suggestions for what you’re most interested in reading next (or just for the reading club in general). Additionally you can view past weeks reading, if you missed a previous book. You’ll also find next week’s reading at the end of this post, and in the forums. Finally, if you’re new to the Comic Book Herald reading club, you or your friends/family/strangers-who-might-like-comics can join here. You can join at any time! It doesn’t take long to notice just how unwieldy the cosmic landscape is in the Marvel Universe at this point in the 2000s. By 2006, Keith Giffen, Dan Abnett, and Andy Lanning would launch Annihilation and solidify a much tighter (and more interesting) Marvel cosmic. Here in the early 2000’s, though, Marvel Cosmic is almost entirely referential to the house that Jack Kirby and Jim Starlin built, and we see that reflected in the reading. The end result is varying degrees of shaky, with Grant Morrison looking to create something new out of the legacy of the Kree and Captain Marvel comics. 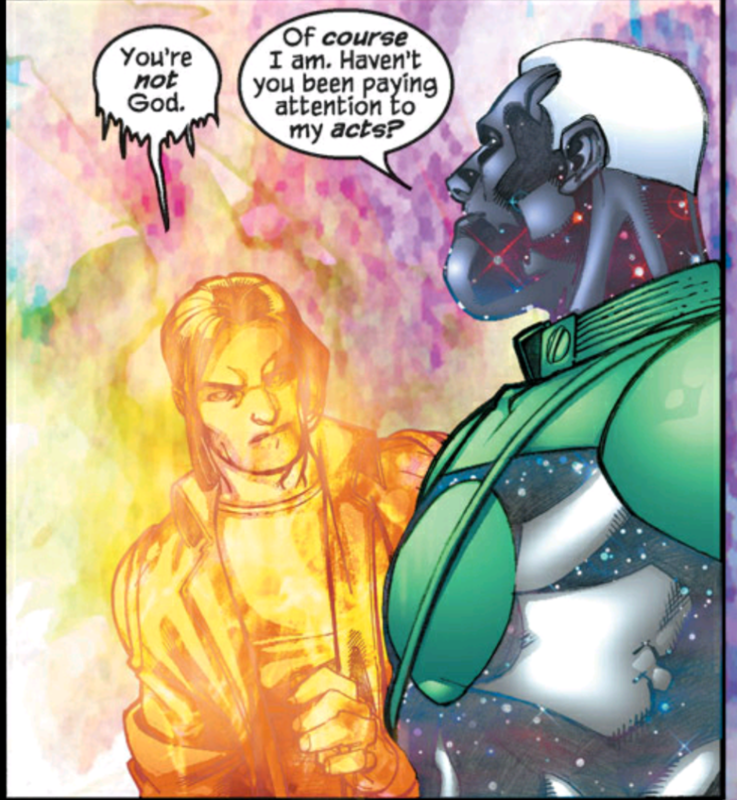 Meanwhile, Peter David takes the opposite approach and completely deconstructs the new Captain Marvel, literally unraveling his mind through Captain Marvel’s famed cosmic awareness. Long story short: Marvel had a ways to go to get out from Jim Starlin’s cosmic shadow (Jim Starlin wrote Infinity Gauntlet, among many others, for newer readers), and we see that in these early cosmic comics. Nonetheless, I think we find varying degrees of quality in these pages, still worthy of discussion. Ok, full disclosure: I mostly included Marvel Boy on the reading club list because I wanted to read the book again. I read this series when I was starting my Marvel odyssey, and I didn’t think much of it at the time. I’ve had similar experiences with Grant Morrison comics where once I return to the series a second time, with a fresh set of eyes and perhaps some newly accumulated comic book knowledge, I enjoy the series much more. This happened with All-Star Superman, which I now consider a great read. This feeling compounded when I realized the influence of Morrison’s creation on the Marvel landscape. Marvel Boy has a strong role in everything from New Avengers: Illuminati to Dark Avengers to Young Avengers (I’m sensing a trend) to Original Sin. I was hoping for the same second-read resurgence from Marvel Boy. I was let down. There are still some conceptually great ideas within this miniseries, such as Hex the living corporation or The Cube prison for aliens. As a whole, though, Marvel Boy is very messy, and ultimately just doesn’t give the reader much characterization to latch onto. Yes, Marvel Boy is a cool, young action hero, and yes, running around New York burning a curse to Dum Dum Dugan is fun in theory, but the execution is just very light. I’m strangely intrigued by Marvel Boy’s desire to turn Earth into a New Hala, but I never feel like we get anywhere near approaching his Kree heritage or what this would look like from a scorned Kree soldier. It’s the big bads that really make Marvel Boy taxing, though. 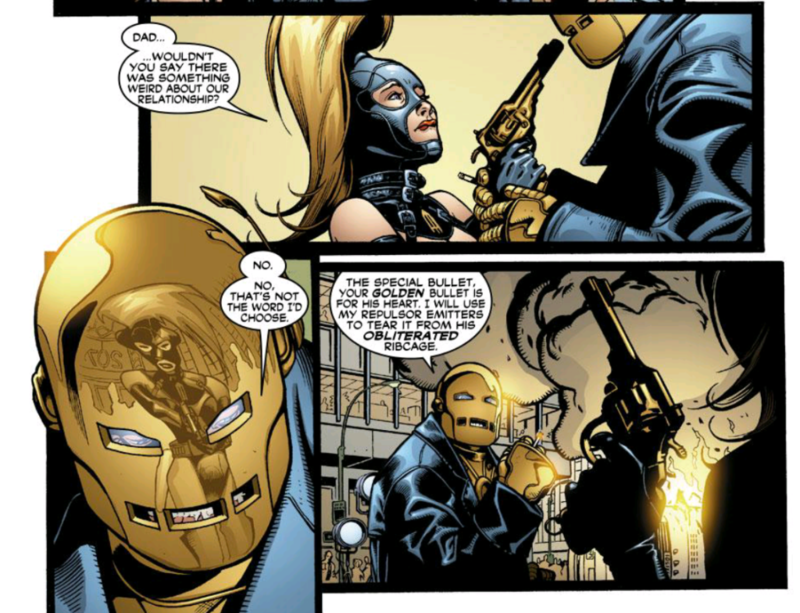 Dr. Midas and Oubliette are all concept and no substance, and it’s extremely hard to tell where Grant Morrison’s meta commentary and tongue-in-cheek parody end, and the actual story begins. Mix that in with his pension to move at warp speed, story details be damned, and his ability to speak alien a little too well, and it’s a slog. I was astounded re-reading this series just how much of Jason Aaron’s Original Sin actually draws from Marvel Boy. I had completely forgotten the involvement of the Mindless Ones within Marvel Boy, although that element of Original Sin now makes a lot more sense. Nonetheless, the influence here isn’t enough to make me ever really want to reread Marvel Boy, or even recommend to future readers. I had hoped it was secretly just too smart for its own good, but the layers to Marvel Boy stop and end at the surface. Speaking of smart comics, I have a definite love for Peter David’s work on this volume of Captain Marvel. It’s a bit of a weird comic in that David wrote 28 issues of Captain Marvel from 2000 to 2002, and then the series got cancelled and rebooted in a weird “best comic survives” death match with other Marvel titles. David does something completely fascinating with this opportunity. Rather than play it safe and continue the lighthearted buddy comedy farce of the first 28 issues (generally fun, rarely substantial), Peter David decided the new Captain Marvel would explore what it means to be a god. Given that background, I find Captain Marvel shockingly good. The commentary is far from subtle, but I’m ok with that. David and the creative team pick a theme, and they’re very clear that they’ll be exploring Captain Marvel after he gains cosmic awareness and loses his mind. Is Captain Marvel god? What does it mean if god is insane? How does Rick Jones get a guitar in the microverse? It’s a wonderfully executed Marvel series, that admittedly will be too dark and depraved for some comics fans. I’m not necessarily all-in on a comic just because it’s “dark,” but in the case of Captain Marvel I find the increased seriousness extremely effective. 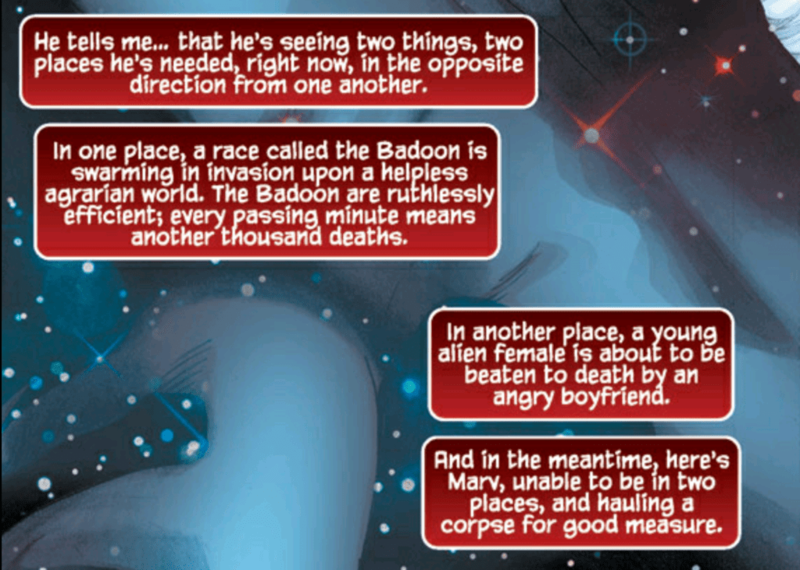 It’s rare that Marvel superhero book is this invested in philosophy, or at least so overtly. I’d also argue that despite the headier themes, Captain Marvel doesn’t lose its sense of humor. Yes, the humor is blacker than it was when Captain Marvel and Rick Jones were engaged with simple dating hijinks, but there’s no denying that it’s still fully present. Of the two reads this week, Captain Marvel is definitely the one I feel good about recommending to future readers. 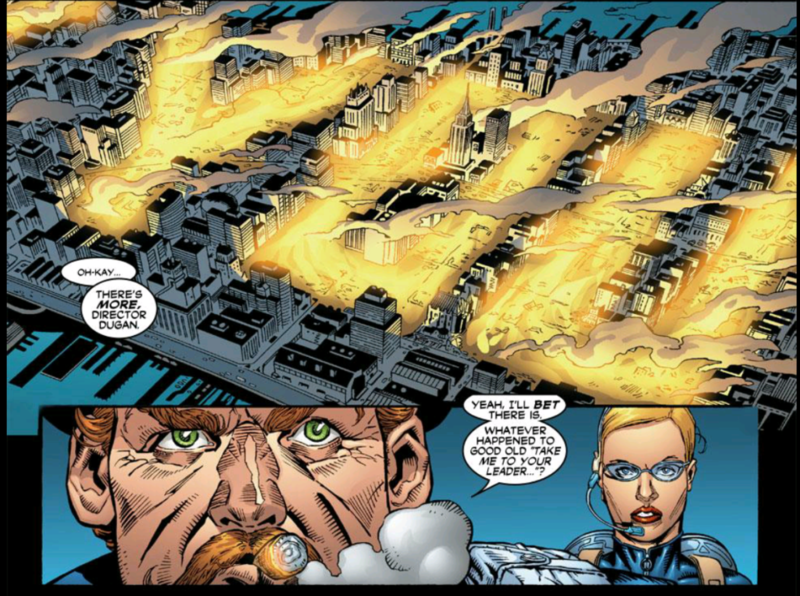 We’re going to do one more selection from the Marvel Knights era before we really start picking up the pace and getting to the modern era of events. Join us in the forums for discussion this week, and enjoy the comics!